For a man who missed 18 months of cricket at the height of his career thus far, Toby Roland-Jones has a very pragmatic view on things. Twice stricken by a stress fracture in his back, Roland-Jones was denied the opportunity to tour Australia last winter after a very impressive Test debut summer. He burst onto the international stage in July 2017 with a five-wicket-haul against South Africa, taking the first four wickets in his first 33 balls. It was a dream start but, by September, his Ashes hopes were shattered, leaving the field against Lancashire with the damage sustained. He has undoubtedly had a difficult time. After featuring for the England Lions and then for his club at the start of last season, two games in which there were problems again. Recovered? Try worse: the fracture was two millimetres larger than before. The lay-off was even longer this time; just 21 overs in, his season was done. Yet the Middlesex paceman knows his bad luck could have been worse. 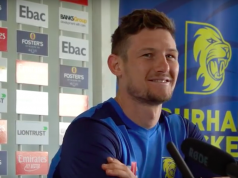 “I never had an injury that was too serious in that [first five year] period, which is probably the reason that I got into that England squad in the first place because I was able to consistently back up performances rather than being someone who burst on after one sparkling summer,” he said at Middlesex’s annual media day. There is, of course, another Test summer on the horizon that a fully fit, fully functional Roland-Jones would love to play in. But so too would Jamie Porter, Jofra Archer, Mark Wood, Jamie Overton, among others. England have plenty of options in their pace attack and Roland-Jones, despite his brilliant start in 2017, has slipped down the pecking order. He is instead staying level-headed about how his season might turn out. “I’ve got ambitions to try and represent England again, of course I do, but I think reality states that you have to, in my situation, be a bit more in the present than that right now. “I think it’s something that you have to be a little bit cautious about overreaching maybe for that, purely on the basis that there’s lots to take care of and look forward to here first and foremost. The first step is putting in the overs for Middlesex, whom he has served so ably since 2010, including that famous hat-trick to win the 2016 Specsavers County Championship title. A pre-season trip to La Manga in February gave him the first opportunity to get into his rhythm. Last month, he bowled his first competitive overs in nearly a year, picking up three wickets in a pair of friendlies against Hampshire and took 4-45 against Oxford MCCU. 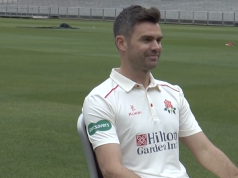 Getting back to his best will not be an easy journey, and he acknowledged not only that he must battle to be in the Middlesex side but that he must also focus on playing as much as he can without breaking down again. “Physically, everything was in place and felt good and everything we hoped to achieve out of that game with the number of overs on a pretty decent wicket that lost a bit of bounce but that made it a nice, stern test, and that’s what you want for those sort of games. And I felt in good rhythm to go with it. “I don’t really set targets, I’ve never been a 50-wicket man or anything because it’s so dependent on other factors. But I guess if there’s anything it’s about playing games. That’s the thing that’s motivating me right now is to string a number of games together and to be fit for them. Roland-Jones has spent the better part of a decade proving his talent. His resolve is clearly strong enough; now he must prove his fitness. If ‘RoJo’ can find his mojo once again, he will not go far wrong.